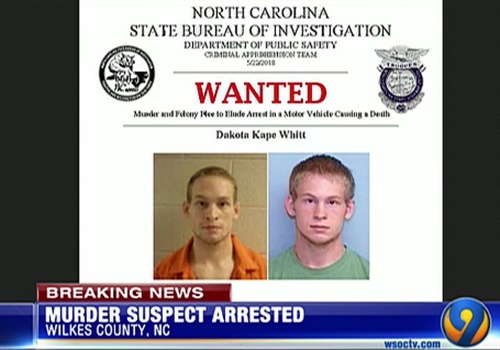 A man wanted following a fatal crash involving a North Carolina Highway Patrol trooper has been captured, reports WSOC-TV. Authorities had been looking for 22-year-old Dakota Kape Whitt after Trooper Samuel N. Bullard, 24, of Wilkes County, died late Monday night in a crash along Interstate 77 in Yadkin County during a chase. "Our SHP family is devastated by the loss of Trooper Bullard. We are struggling to find words that describe the hurting we feel right now," said Col. Glenn M. McNeill Jr., commander of the State Highway Patrol. "Trooper Bullard died as he was fulfilling his promise to the people of North Carolina, protecting and serving his community." Whitt was taken into custody without incident around 3:30 a.m. Wednesday. He's charged with murder, felony fleeing to elude arrest in a motor vehicle, and driving with a revoked license.